Passport cannot be used on ice protecting a remote server. Nothing is secure when you have the right documentation. Cute, little marvel. One of the four in-faction Decoders and the most cost-effective. Comparing to others, it is in most cases cheaper to operate than Peacock and more persistent than Cerberus "Rex" H2 (I'll take a liberty of not mentioning the Leviathan...). Most notably it deals easily with Quandary, Enigma, Datapike and Viktor 1.0.
the most obvious and the most important: Lotus Field. Popular Yog's bane falls prey to this humble little Decoder. 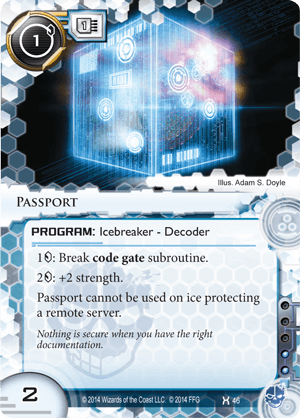 Inazuma, Viktor 2.0 and Tollbooth: popular and dangerous high-strenght Code Gates - still expensive, but totally passable, even without DS tokens. Now, there are two more comparable Decoders worth mentioning: ZU.13 Key Master and Refractor. First, while Refractor is deadly effective, it requires specific deck build to work. It's of the same base strength as Passport, so without stealth credits it's marginally better at the cost of influence. ZU on the other hand has one less strength, which adds up throughout the game. Though with the upcoming cloud-based icebreakers, it can be more interesting in the near future. In summary: for a persistent central pressure it is a weapon of choice, saving up influence and precious Rex's counters, better spent elsewhere.